DEARBORN – It was an unfavorable outcome for some new candidates in Dearborn and neighboring cities’ primary elections, but some might have another shot at making it into office on Nov. 7. 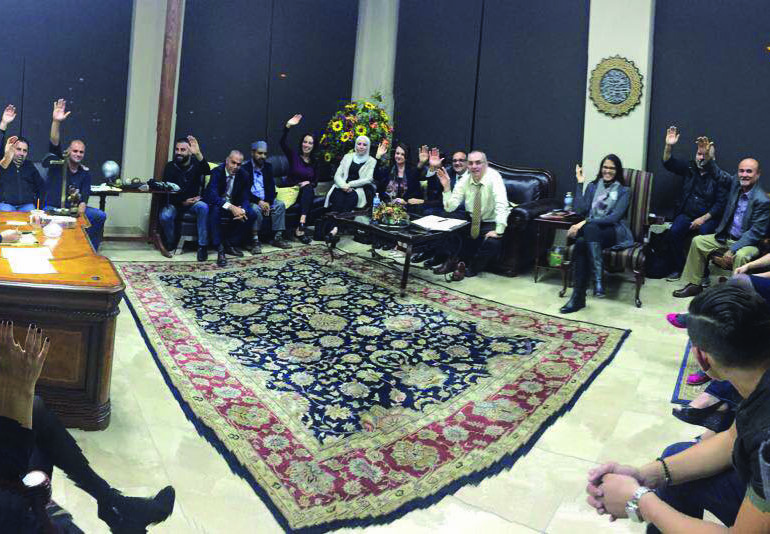 After a passionate debate on Tuesday, Oct. 17, The Arab American Political Action Committee (AAPAC) endorsed candidates in the general elections for Dearborn, Dearborn Heights, Hamtramck and Detroit. Its members sought to give young and new candidates an opportunity to bring about change and to bring Arab American issues to the table in city government. Formed in 1998, AAPAC’s membership consists of Arab American professionals who work to organize and encourage Arab American political engagement. According to AAPAC’s bylaws, members may only consider candidates who have requested an endorsement from the organization in writing. Those who have already been interviewed for consideration during past elections do not necessarily need to undergo second evaluations. However, candidates need to get the nod of approval by two thirds of the members in good standing who are voting on the endorsements in order to get the organization’s support. In Dearborn, where the first contested mayoral race since 2001 is brewing, the committee chose to endorse incumbent Mayor Jack O’Reilly over long-time Councilman Tom Tafelski. Although some members argued that a change in leadership at the top is needed, others questioned the councilman’s voting record against Arab American issues and his lack of engagement in the community. Most members said they believed that a steady hand at the top is extremely important at this juncture, especially with multiple developments taking place in the city and its surroundings. AAPAC President Mona Fadlallah told The AANews that members felt O’Reilly has more experience to foster investment and oversee the Ford development and other initiatives currently on the front burner. She also said AAPAC members believe that O’Reilly had listened to the Arab American community in the past, even though much more is needed to be done to diversify the work force of the city and incorporate members of the community in the administration. She assured the community that a commitment to reflect Dearborn’s diverse population at City Hall has been achieved. AAPAC did not make an endorsement for City Council in the August primary, choosing instead to wait and consider who to endorse in the general election. After discussion and debate about the candidates on Tuesday, AAPAC members agreed on endorsing the following individuals for the seven open seats: Michael Sareini, Susan Dabaja, Fayrouz Bazzi, Ramez Haidar, Leslie Herrick, Nada Al-Hanooti and Erin Byrnes. Only two are incumbents – Sareini and Dabaja. Both are Arab Americans and the top vote getters in the primary. Following former City Clerk Kathy Buda’s sentencing for embezzling cash from the cashier’s box at City Hall, Dearbornites have been seeking transparency. 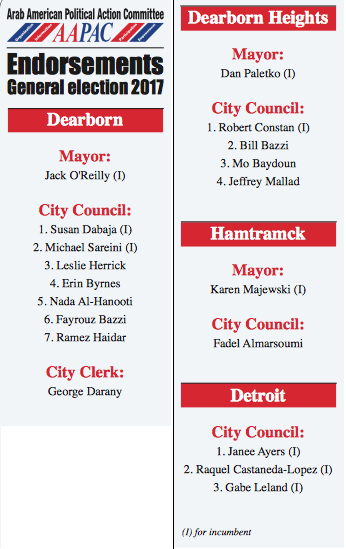 With that in mind, AAPAC chose to endorse former State Rep. George Darany (D-Dearborn) for City Clerk. Fadlallah said based on an interview with Darany during the Aug. 8 primaries, many members thought he was well-qualified and brought many new and positive ideas, like extending the clerk’s hours and implementing measures against voter fraud. Darany, an Arab American who served in Lansing from 2011 to 2017, will compete against Nofila Haidar. AAPAC also endorsed newcomers in Dearborn Heights, which has a gradually shifting demographic and seeks to emulate Dearborn by strengthening its business corridors. For mayor, members voted to support incumbent Mayor Dan Paletko. Many thought he’d been receptive to Arab Americans’ concerns while in office, while his opponent, Councilwoman Lisa Hicks-Clayton, had not demonstrated that leadership. During his tenure, Paletko has made several improvements in the city and survived the economic downturn, while also encouraging businesses to move to Dearborn Heights and expand the city’s property tax base. If Hicks-Clayton loses the race, she retains her seat on the City Council. Seven candidates are competing for four seats on the City Council. Councilman Thomas Berry withdrew from pursuing reelection, but his name will still appear on the ballot. For the Dearborn Heights’ City Council race, AAPAC endorsed Councilman Robert Constan and newcomers Jeff Mallad, Mo Baydoun and Bill Bazzi. In Hamtramck, a highly diverse city with about 30 percent Yemeni American residents, AAPAC endorsed incumbent Mayor Karen Majewski over Councilman Mohammed Hassan, who didn’t seek AAPAC’s endorsement. With a heavily concentrated immigrant population and a shake up in the City Council following disparaging remarks by some members, the community is eyeing a sympathetic leadership. AAPAC’s members felt Majewski has championed diversity in the city during her tenure. For City Council, AAPAC supported only one of the six candidates competing for three open seats, Iraqi American Fadel Almarsoumi. “At AAPAC, we endorse based on principle and the best interest of the community, not what the outcome might be,” the organization’s past president, Ali Hammoud, said. In Detroit, where a great many Arab Americans live and do business, AAPAC endorsed three incumbents from a pool of 20 candidates for City Council: Gabe Leland of District 7 in west Detroit, Raquel Castaneda-Lopez of District 6 in south Detroit and Councilwoman at-large Janee Ayers. Seven of Detroit’s nine Council members are elected in districts, while the remaining two “at-large” members are elected city-wide. AAPAC members also voted to contribute $1,000 to Lebanese American and Dearborn-native Fayrouz Saad’s campaign for Congress in Michigan’s 11th District in 2018. AAPAC will publish its endorsement in a newsletter that’ll be mailed to Arab American voters in the above cities. AAPAC will also hold its 20th annual dinner on Wednesday, November 1 at 6:30 p.m. at the Bint Jebail Cultural Center in Dearborn.